Robert Leonard Charles Thredder was born in London and moved to Great Dunmow as a toddler. He was educated at Braintree and became a father by the time he was 17. After working at Crittall's in Braintree he joined the army. He was fatally injured in Chelmsford in September 1939 when he was thrown from his motorbike along Chelmer Road, causing a fractured skull from which he died. His was the first military casualty of the war in Chelmsford. Robert was born in east London in 1918, the son of Leonard James Thredder (1893-1949) and Lydia May Thredder (nee Ratcliffe) (1899-1932). His parents had married in 1917 and were living in Great Dunmow by 1920. Robert had a younger sister, Mary Thredder, born in 1926. Robert's father was a bootmaker and in June 1934 after fourteen years membership of Dunmow Fire Brigade he was appointed Captain, in succession to the late Mr. Jospeh Byatt who had died four months earlier. "Sudden Death.—On Sunday evening Mrs. Lydia Thredder, 33, wife of Mr, Leonard Thredder, bootmaker, of High Street, Dunmow, was paying a visit to the Felsted Sugar Factory with her husband, when she fainted in the factory, and was removed to the Factory Bungalow, the residence of Mr. and Mrs. Brown. Dr. Winter attended her, but she died at midnight without regaining consciousness. Death was due to cerebral hemorrhage, and an inquest was not necessary. Mrs. Thredder leaves a husband and two children. The funeral will to-day (Friday) 2.30, at Dunmow Parish Church. Robert was educated at the County High School in Braintree. In June 1934 he was one of only three students at the school to gain honours in the London General School Examination. "Lad' s Predicament. - Robert Thredder, Stortford Road, Dunmow, was summoned by a Kelvedon woman to show cause, etc. - Mr. F. Collinge was for the applicant; - Mr.A. E. Floyd for respondent. - Applicant stated that she was 35 years age. She went to the house of respondent's father at Dunmow after the death of Mrs. Thredder, to look after the place and children. - The respondent, on oath, stated that he was now 17 years of age. He was aged 15 when applicant came to work at his father's house. He admitted certain acts, but did not admit paternity, He won a scholarship at a high school, and was attending there, but owing to this case he had had to leave, and hisprospects were shattered. He had no means. He was not at work. - Mr. Floyd, addressing the Bench, alleged that respondant was encouraged by a woman old enough to be his mother. He asked the Bench to consider his circumstances, and also that respondent had means, The Chairman said the Bench found that Robert Thredder was father to the child of applicant, born on Aug. 5. The Bench had taken all the circumstances into consideration, and there be an rorder for Thredder to contribute one shilling a week until the child 16. Costs remitted." After working at Crittall's in Braintree and also enroling as a fireman in the Dunmow Brigade Robert During joined the army and served as Private 10081004 in the Essex Regiment. On 11th September 1939, around 9 p.m., a lorry driver travelling along Chelmer Road (the then A12 Chelmsford by-pass), discovered 21 year-old Robert lying unconscious in the road close to the junction with Sandford Road in Chelmsford. He was seriously injured and had apparantly been thrown off his motor cycle which was found nearby. Robert had been returning to gis army camp when the incident occurred. Although rushed to hospital Robert died from his injuries the following morning. His was the first Chelmsford casualty of the wartime blackout. "BY-PASS TRAGEDY AT CHELMSFORD - YOUNG DUNMOW SOLDIER KILLED - FOUND UNCONSCIOUS IN ROAD. At 9 p.m. on Monday a lorry driver proceeding along the Chelmsford by-Pass road at the junction of Sandford Road, noticed something lying by the side of the road stopped and found a young soldier, unconscious, with a motor bicycle near by. The lorry driver informed the police, and the injured man was rushed by ambulance to Chelmsford Hospital, where he died without regaining consciousness. The deceased was later identified as Private Robert Leonard Thredder, aged 21, of Stortford Road, Dunmow. His ather is the captain of Dunmow Fire Brigade, and he is well known and respected the district. So far, there has been no explanation as to the cause of the accident, but it is possible that, with lighting restrictions in force, deceased's motor cycle may have hit the side of the road in the darkness. An inquest will be held at the Shire Chelmsford, to-morrow (Saturday), at 11.30." "DYING IN ROAD - YOUNG DUNMOW SOLDIER'S DEATH AT CHELMSFORD. A young soldier's road death at Chelmsford was the subject ot an inquest at the Shire Hall, Chelmsford, on Saturday, before Mr. L. F. Beccle, coroner. The deceased was Pte. Robert Leonard Charles Thredder 21, son of Mr. L. Thredder, of Stortford Road, Dunmow. He was found unconscious and dying on the Chelmer by-pass at Chelmsford shortly after 9 p.m. on Sept. 11, with a motor cycle near by. The deceased's father said his son had been motor cycling since he was 17. He left home at 8 p.m. on Monday to return to his regiment. When he left, everything was in order and he went off very steadily. P.c. Wm. Howes deposed that at 9.15 p.m. on Monday, while at Police Headquarters, he was inlormed that an accident had occurred on Chelmer Road. He proceeded there, and at the junction of Sandford Road he saw the deceased lying on the near side greensward facing London. Deceased was unconscious and was being attended to by people from nearby houses. An ambulance arrived and deceased was conveyed to hospital. Deceased's motor cycle was standing on the off side of the road. The Coroner: It had been moved? —Yes. sir. Witness added that the lights of the machine which had been adapted to comply with regulations, were in order. There was no severe damage to the machine. Marks upon it were consistent with it having fallen on its side without it having been struck. A motor lorry was standing in front of the deceased. Its headlights were not working, but its sidelights were adapted to meet the regulations The road was practically straight at the spot. It was dark night and there was a slight dampness in the air. Dr. L. T. Bond, pathologist, said death was due to fracture of the skull and injury to the brain. In reply to deceased's father, Dr. Bond said the injury was consistent with the deceased having fallen backwards on his head. When the lorry driver, John Wm. Charman, of London Road, Redhill, was called, there was no answer. The Coroner said he supposed the witness was delayed. " I don't think he is very important witness," he added. Deceased's father: My son was a capable driver, and there are one or two things I should like to know from Mr. Charman. There is nothing to explain why my son should have fallen from his machine, if he did fall off. The Coroner: There is nothing to explain it at all. The father: Then I think that Mr. Charman is a very material witness. He could give the position in which he found the body; he could say whether the lights were on the motor cycle and whether the engine was still running. The Coroner said he had a written statement from Mr. Charman that he (Charman) was driving his two-ton lorry along the Chelmstord by-pass. He had his wing lights on only, they were adapted to comply with the regulations "As I approached the Sandford Road junction I eased almost to a standstill," the statement went on. "My vehicle was just in motion when I saw a man in the road, just on my off side. I then noticed a motor cycle lying further on my off side, with its lights alight; facing towards Sandford Road. I immediately stopped, called to a passing couple to assist me to move the man to the side of the road, as was afraid he might be run over .... It was a very dark night, but fine. My headlights were not in order and I was not using them." The Coroner: There is no evidence that the lorry had anything to do with the accident. The father- No and I should like to thank Mr. Charman for all he did. The Coroner returned a verdict of Accidental death, observing that deceased must have been thrown from his machine through some unknown cause. Just is the inquiry finished, Mr. Charman arrived and explained that he had got there as soon as he possibly could. He was not called to give evidence. THE FUNERAL. On Monday the funeral of Pte. Thredder took place at Dunmow Parish Church, in the presence of a large gathering. The Vicar, the Rev. Noel Mellish, V.C. M.C., officiated. The coffin was shrouded with the Union Jack and covered with floral tributes. At the head of the cortege marched six comrades from the deceased's regiment, members of the Dunmow Fire Brigade (of which the deceased's father is captain), and members of Dunmow Auxiliary Fire Brigade, wearing armlets. During the service Mr. I. Barnard played Chopin's Funeral March on the organ. 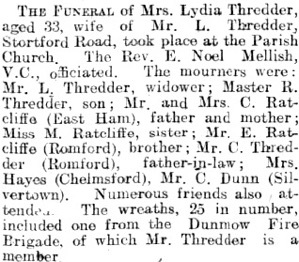 The mourners were: Mr. L. Thredder, father; Miss Mary Thredder, sister; Mr. C. Thredder, grandfather; Mr. E. Ratcliffe (Chadwell Heath), uncle; and Mrs. Alford. The deceased's regiment was represented by Privates Brough. Cousins, Hawkins, Miller, Frayer, and Banyard. The Dunmow Fire Brigade (in which the deceased soldier was probationer) was represented by Sub-Capt. A. Metson, Firemen C. Oakley, T. Goodey, R. Hart, L. Richardson, C. Crowe, J. Bancroft. Auxiliary firemen present were Messrs. G. Goodey, J Gypps, I. Barnard, and J. White. Others attending were Mr. Nicholson, surveyor to the Dunmow Rural Council, who holds the nominal rank of Superintendent of the Fire Brigade; Mr. R. A. Roper, churchwarden; Mr C. Knight, Mr. T. Luckin, Mr. J. Plumbley, Mr. A. Stebbing, Miss A. Byatt, Miss Buck, and Mr. T. Curdling, representing the Progress Department at the Crittall Works, Braintree, where the deceased was employed before he joined the Army. The floral tributes included tokens from all ranks in the Training Centre of the deceased's regiment; from his comrades in the " Somme Squad "; from Dunmow Fire Brigade; and old friends at Crittall's, Braintree." Today Robert lies in St. Mary's Churchyard in Great Dunmow (Plot 5. Row 8. Grave 41). On 27th February 1940 Robert's was one of four men listed on the first Essex Regiment casualty list of the war. There were to be many more. Later that year Robert's father remarried, to Ivy Alford. He died in 1949.